Five years ago, the title of this blog would have been “Why is Having a Website Important to Your Business?” Times have changed, and most people have caught on that having an online presence is a must when competing in today’s business world. Now, the focus has switched to responsiveness – and just like building a home page, this upgrade is essential to successfully promoting your business online. Simply put, responsive web design enables your site to automatically resize to whatever size screen your visitor is using. It optimizes all of your pages so they can be easily viewed on multiple platforms (mobile, PC, tablet, etc.). There’s a whole lot of web coding mumbo-jumbo involved on the back end, but just remember that it’s crucial for reaching people who are accessing your pages from mobile devices. You might ask “Are enough people accessing my site from mobile devices to justify switching to responsive?” The answer is 100% yes. The number of Internet users looking at web pages on tablets and smart phones is expected to eclipse the number of people doing the same thing on desktops and laptops by the end of 2014. The scales are shifting quickly and dramatically toward mobile users, and that means there’s a market that needs to be reached. If you’re considering updating to responsive, it’s also a great time to look at your current design and content. Each of your pages needs to be designed to create a sales funnel that provides your visitors with all the information they need. This requires strategic planning to achieve the level of quality needed to make conversions. While you’re having your website switched to responsive, consider reevaluating the overall quality of your content and design. You’ve probably noticed that there are sites that are easy to navigate on your phone, and one’s that aren’t. The one’s that automatically load fitted to your screen allow you to immediately tap into what you’re looking for. Whereas, the ones that aren’t responsive require you to pinch your screen and drag it around to be able to read the text or find the button you need. Adding this extra layer of difficulty causes your potential customers to get frustrated and move on to your competitors. One usability obstacle is all it takes to get most users to look into another option. Google is the online gatekeeper that determines whether or not your URL reaches the first page of search results. Google’s “bots” crawl through page after page – night and day – determining which sites are the most credible and user friendly. The algorithms that Google uses are built to advocate for the user, and you will be reduced in search ranking if you aren’t able to accommodate visitors coming from mobile devices. 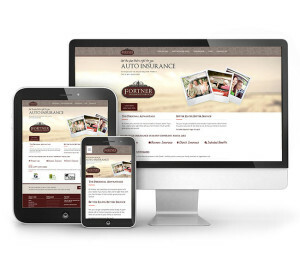 Responsive design is the only way to appease Google in this area and boost your ratings. The switch from non-responsive to responsive is easy and often requires very little change to the design of your existing website. Tapping into this market will dramatically improve any business’ online results and help you get ahead of the curve in the online world.